Maybe coming to an Easter Sunrise Service is part of your Christian tradition—or maybe you’d rather snooze a few more minutes and catch a later service. 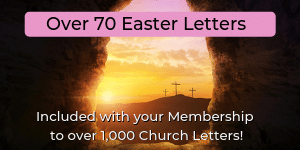 While I’m thrilled to have you attend any one of our Easter services on Easter Sunday, INSERT DATE, I thought I might share some thoughts with you about Logged in Members, CLICK HERE to view and/or copy full text! Have you heard the good news? Well, yes, winter is finally over, and yes, all of your favorite sweet treats are currently stocked on all the grocery stores’ shelves, but it’s even better than that—yes, even better than the Cadbury Crème Eggs and Peeps. Oh, but it goes far deeper than that! Logged in Members, CLICK HERE to view and/or copy full text!